Owing to the presence of our expert team members, we are able to offer a wide range of Aerosol Containers. Do not pack aerosol in flammable containers. Metal India Products Pvt. Ltd.
brand image is done to suit the market and industry requirements. 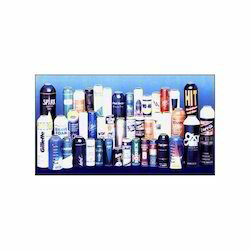 We offer a comprehensive range of aluminum aerosol cans that are designed as per the specific requirements of the clients. The aerosol or flammable containers are not packed. aero Pack Products Pvt. Ltd.